In a series of experiments, Lawrence Livermore National Laboratory researchers used the Omega laser system to compress iron up to 5.6 million atmospheres (5.6 million times the pressure at the Earth's surface), a record pressure for solid iron. (Phys.org) —Iron is the most abundant element in Earth's core and the sixth most abundant element in the universe. As a key component of terrestrial planets and exoplanets, iron has been one of the most studied materials under extreme conditions. In a series of campaigns led by the Lab's Yuan Ping using the OMEGA laser at the Laboratory for Laser Energetics (LLE) at the University of Rochester, researchers compressed iron up to 5.6 million atmospheres (5.6 million times the pressure at the Earth's surface), a record pressure for solid iron. The record pressure is achieved by multi-shock compression. Using a series of shocks (rather than a single shock) keeps the entropy low while compressing the material, which is the key to keeping the temperature lower than the melting point and allowing the iron to remain solid. Diagnosing the material properties under extreme conditions is as important as the creation of high-pressure states. The team employed an X-ray technique called EXAFS (extended X-ray absorption fine structure). EXAFS is a powerful tool widely used in material science but its application in materials under extreme conditions is still in its infancy. This work presents the first EXAFS data in high-energy-density (HED) matter. The EXAFS data show that the close-packed structure of iron is stable in the regime explored, confirming simulation predictions and other experimental studies by X-ray diffraction up to 3 million atmospheres. Unexpectedly, the team found that the temperature at peak compression is significantly higher than that from pure compressive work. Extra heat is generated by inelastic distortion of the lattice, termed plastic work. It is found that upon fast compression in a few billionths of a second, the strength of iron is enhanced, leading to more plastic work and the elevated temperature. "It took us more than two years to develop this experimental platform." Ping said. 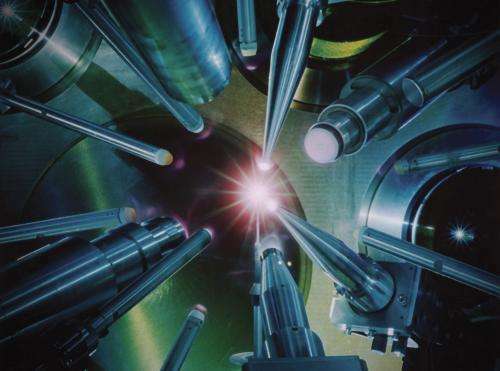 "Now the measurements can be scaled up to larger laser systems, such as the National Ignition Facility, to reach higher pressures or extended to shorter time scale to study dynamics in HED materials." The team's research appears in the August 9 issue of Physical Review Letters. What can be learned from this research? It would help narrow down the true composition and density of planetary cores if you knew by experiment the exact configuration and density of iron under those conditions. I'm really tired of reading all the pseudo-science answers to these questions. Example from Wiki Answers to "What is the sun's surface?" - "bit of helium, oxygen and other elements, but it's mostly hydrogen plasma." B.S. Example from Yahoo Answers: "Since the Sun is a gas ball, there is no hard "surface" on which to set instruments to measure the pressure of the Sun's gasses" more B.S. And from http://csep10.phys.utk.edu ! "The Sun is a ball of gas, so it does not have a well-defined surface. When we speak of the surface of the Sun, we normally mean the photosphere." my word! How could an object so immense possibly maintain a gaseous state? Where are the scientists?!?!? The pressure at the bottom of the photosphere is a whopping 285 mb (=0.281 atm), a far cry from the conditions of 5.6 million atm mentioned in the article. Also there's differential rotation of the sun's surface. The period of rotation at the equator is 25 days, but nearer the poles it's slower, about 30 days. The surface is most certainly not solid. I'm going to assume they are talking about faster time resolution on their measurements when they say shorter time scales. Antialias is correct about studying planetary cores, but there's a much more practical reason to do this. Based on simulations, we believe that many materials have exotic super-phases under extreme conditions. The properties of these super-phases could be things like frictionless fluids, very high temperature supercondutivity, ultra high tensile strength, catalytic properties, electrochemical or thermoelectric properties, etc. Some of these super-phases are believed to be stable at room temperature and pressure once you create them. These kinds of materials will enable truely unimaginable jumps in what is possible to engineer in the future. You know, we haven't even scratched the surface of materials science. All the elements and the limitless combinations of them have properties that remain unknown to us, even under 'normal' conditions. Then they all have DIFFERENT properties when you break them down into various sizes and shapes of nano-sized particles and/or when they have nano surface textures. Then there's also a COMPLETELY DIFFERENT set of properties under extreme conditions. Then you ALSO can get totally different results when you combine the exact same ingredients with two different processes. You didn't read the http://www.thesur...esun.com site one bit. At sea level on Earth, atmospheric pressure is around 1,013 millibars. There is nothing "whopping" about that. What's also important is what is not mentioned in the article, that researchers have been able to maintain iron's solid state at temperatures far exceeding those found on the surface of the sun. @baudrunner- reality check: the density of the sun (measured to the apparent surface) is 0nly 1.4 g/cc, or 6x less dense than iron (barely denser than water.